The warming of the Indian Ocean, caused by global climate change, may be causing a slow decline in wind power potential in India, according to a new study from the Harvard John A. Paulson School of Engineering and Applied Sciences (SEAS) and the Harvard China Project. India, the third largest emitter of greenhouse gases behind China and the United States, is investing billions in wind power and has set the ambitious goal to double its wind power capacity in the next five years. The majority of wind turbines are being built in southern and western India to best capture the winds of the Indian Summer Monsoon, the seasonal weather pattern that brings heavy rains and winds to the Indian subcontinent. However, the researchers found that the Indian monsoon is weakening as a result of warming waters in the Indian Ocean, leading to a steady decline in wind-generated power. “We found that although India is investing heavily in wind power to tackle climate change and air pollution issues, the benefits of these substantial investments are vulnerable to the changing climate,” said Meng Gao, a postdoctoral fellow at SEAS and the Harvard China Project and first author of the study. The research, published in Science Advances, calculates the wind power potential in India over the past four decades and finds that trends in wind power are tied to the strength of the Indian Summer Monsoon. In fact, 63 percent of the annual energy production from wind in India comes from the monsoon winds of spring and summer. Over the past 40 years, that energy potential has declined about 13 percent, suggesting that as the monsoon weakened, wind power systems installed during this time became less productive. 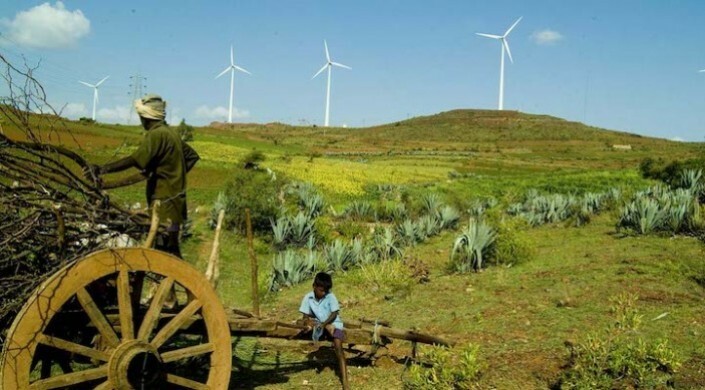 Western India, including the Rajasthan and Maharashtra states, where investment in wind power is the highest, has seen the steepest decline over that time period. However, other regions, particularly in eastern India, saw smaller or no decline. “Our findings can provide suggestions on where to build more wind turbines to minimize the influences of climate change,” said Michael B. McElroy, the Gilbert Butler Professor of Environmental Studies and senior author of the study. Next, the researchers aim to explore what will happen to wind power potential in India in the future, using projections from climate models. This research was co-authored by Yihui Ding, Shaojie Song, Xiao Lu, and Xinyu Chen. It was supported by the Harvard Global Institute.